THERE WILL BE NO FERMILAB ILC R&D MEETING THIS WEEK. This is the fourth article in a series on the MINERνA neutrino experiment. Previewing the potential of neutrinos as a tool to study matter, nuclear physicists will conduct research with the MINERvA experiment and its high-flux neutrino beam to probe atomic nuclei within the six-ton detector in the NuMI Near Hall. This unusual overlap of fields will use the unique properties of neutrinos, which experience only the weak force and carry a neutral charge, to investigate the structure of the individual nucleons-a largely uncharted realm. "A portion of the nuclear physics community, largely centered at Jefferson Lab, has moved away from the traditional nuclear physics, which explores the properties of nuclei, and has begun making precision measurements of the nucleon structure," says nuclear physicist Ron Ransome of Rutgers University. "We want to understand in detail how one makes the transition from a scale where only quarks and gluons matter, to the scale where we need only consider composite particles, the nucleons and mesons." 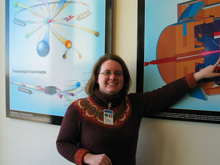 The MINERvA nuclear physicist groups are from Rutgers (the State University of New Jersey); from Hampton University, James Madison University and Thomas Jefferson National Accelerator Facility, all in Virginia; and from the University of Rochester, drawing from both high energy physics and nuclear physics. Experiment cospokesmen Jorge Morfin of Fermilab and Kevin McFarland of Rochester saw the benefits of collaborating with nuclear physicists early in the development of MINERvA. Ransome, Thia Keppel of Hampton University and Jefferson Lab and colleagues from their respective institutions joined after attending an organizational workshop in mid-2002. Ransome, Keppel and colleagues were among individual EOI's (Expression of Interest) presented to the Fermilab PAC in November 2002 by Morfin and McFarland, and the combination of these collaborations became MINERvA. "MINERvA offers us the possibility of making a bridge in our understanding between the longer distance-scale properties of the nuclear force--responsible for the properties of nuclei--and the very short-distance scales explored in particle physics," says Ransome. "And this intermediate distance scale is of great interest to both communities." WASHINGTON , DC � The Department of Energy (DOE) today issued a Preliminary Notice of Violation (PNOV) to the University of Chicago (University), the Management and Operating contractor for DOE�s Argonne National Laboratory (ANL), for nuclear safety violations identified through several safety reviews and inspections conducted by DOE. A series of reviews and inspections, the most recent of which occurred in 2005, identified breakdowns in the contractor�s quality improvement, radiation protection, work process, and independent and management assessment programs. Prior to 2005, senior contractor management at ANL failed to adequately comply with DOE�s nuclear safety regulations that govern these programs. DOE�s investigation of the safety review findings found that these issues have existed for a number of years, and the University�s efforts to correct these problems were largely ineffective. The identified deficiencies have not caused significant radiation exposures or other nuclear safety incidents. However, DOE noted in a letter to the ANL that it was simply fortuitous that no harm had occurred to ANL staff, given the breadth and duration of the identified violations. Last year, the University appointed a new management team at ANL and has given the new lab director the resources and support necessary to upgrade the nuclear safety program. The new director has already begun to take corrective actions and initiated others to address other problems, including the implementation of a new safety program infrastructure. While Saturday Morning Physics lectures grow from the science practiced at Fermilab, from accelerators to quantum theory, they are always illustrated with connections to everyday life. "Saturday Morning Physics does not pretend to rigorously 'teach' a subject such as quantum mechanics in a single two-hour lecture," said Roger Dixon, Head of Fermilab's Accelerator Division and co-director of the Saturday Morning Physics program. "Instead, our lecturers strive to convey the excitement of the subject, so the students will leave the lecture wanting to know more. The best outcome is for a student to make a decision to pursue science as a career. The next-best outcome is for a student to leave the program feeling that science is a very worthwhile activity." Saturday Morning Physics students come from approximately 80 high schools throughout the region, although students have arrived from as far away as Indiana, Iowa and Wisconsin. The program is free to students, and instructors volunteer their time. Many SMP graduates have chosen science and technology careers, but Ramberg sees important benefits for all students. "Our goal is to further their appreciation of science," Ramberg said. "We give these kids the opportunity to see how high-level research is done. We hope to contribute to a wider perspective for them. It's a way to reach out to their parents and to the community." 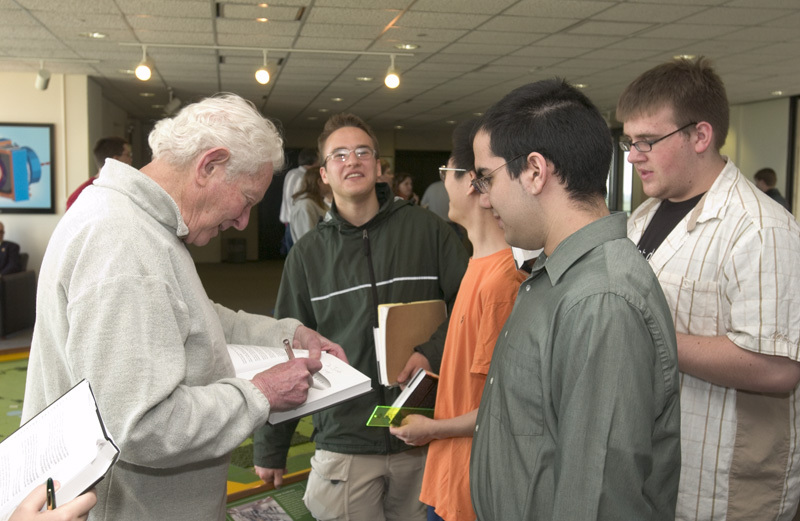 Saturday Morning Physics was founded in 1980 by then-Fermilab director Leon Lederman; physicist Drasko Jovanovic directed the program until retiring in 1997. Roger Dixon and Erik Ramberg, Test Beam Coordinator for Experimental Physics Projects, have been co-directors since 1997. Throughout the program's history, the students' outlook has remained remarkably constant. "They're just the best kids," Ramberg said. "They're always focused on what you're saying. They ask the most incredible questions. They're fun to teach. In fact, it's ridiculous how exciting it can be." There's still time to register online for the next session of the Saturday Morning Physics Program for area high school students, beginning Saturday, March 11 at 9 a.m. in One West. The nine-week session, which is free to students, includes presentations by distinguished Fermilab scientists on topics ranging from an introduction to particle physics; to relativity and quantum mechanics; to cosmology; to matter and anti-matter. There are also tours of experimental areas in the laboratory. High school students can apply online through Friday using the Student's Application Form. The program is limited to 100 students. Technical Specialist Clifford Worby retired on Feb. 28. The Fermilab Barnstormers, the lab's Radio Control Model Airplane Club, is hosting Delta Dart Night tonight, 5:30 p.m. at the Kuhn Barn. Barnstormers will help guests construct, fly and compete with model planes powered by rubber bands. The event is open to all Fermilab employees and their families. For more information, visit the Delta Dart Night Web page. There will be a Fermilab Folk Club Barn Dance on Sunday, March 12 at 6:30 p.m. with music by Joe Samojedny and Friends and calling by Paul Watkins. More info can be found at the Fermilab Folk Club Web page. International Folk Dancing will meet Thursday, March 9, at Kuhn Barn on the Fermilab site. Dancing begins at 7:30 p.m. with teaching and children's dances earlier in the evening and request dancing later on. Newcomers are welcome and you do not need to come with a partner. Info at 630-584-0825 or 630-840-8194 or folkdance@fnal.gov.